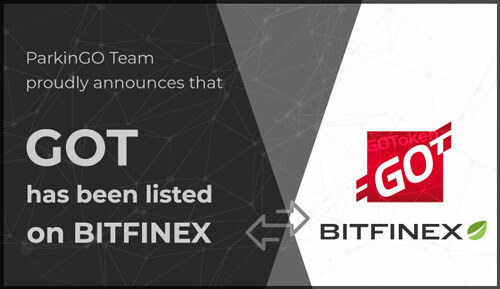 ParkinGO is pleased to announce the quotation of the GOToken (GOT) on the Bitfinex portal, the main platform for the exchange of crypto-currencies (in the last month more than 13 billion dollars have been exchanged). As many of you know, the GOToken is the token created by ParkinGO, which with its 23 years of experience and over 2.5 million customers every year, is moving quickly towards a new vision of key concepts such as simplicity and transparency. We are in front of what can undoubtedly be defined as a milestone of the project on blockchain signed ParkinGO. Thanks to the exchange quotation, the token can finally be bought and sold even by those who did not participate in the early stages of the project. A massive flow of the token that will bring benefits, not only economic, to all those who use it. Trading of the stock is available in US Dollars (USD), Euro (EUR) and Ether Crypto Currency (ETH).